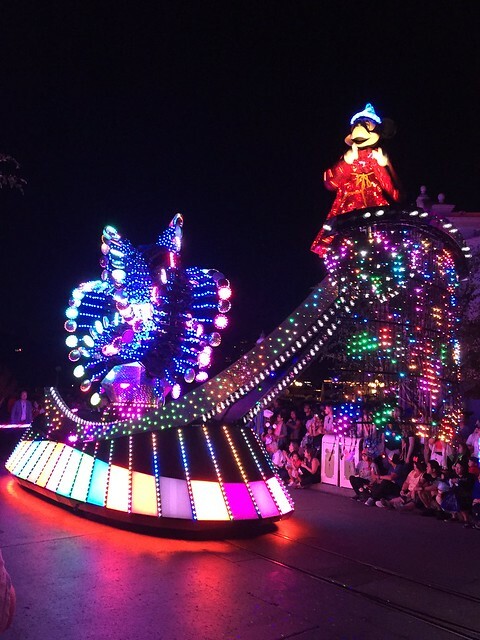 Disneyland Diamond Anniversary Eats – Cin Cin, Let's Eat! Disneyland is currently celebrating its 60th birthday! 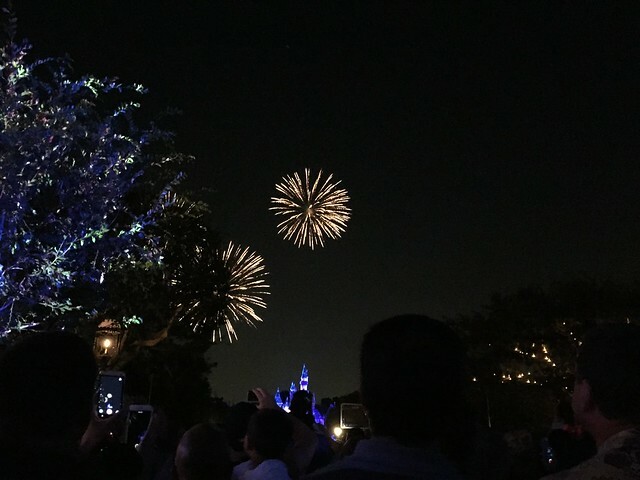 My friends and I had a blast there a couple weekends ago on Disneyland’s actual birthday – July 17th. The park was crowded and our day started early at 5am, we even dressed up in 1955 fashion just like the day the park opened. The celebration will continue for the rest of the year. Here are some snapshots and some yummy park eats. 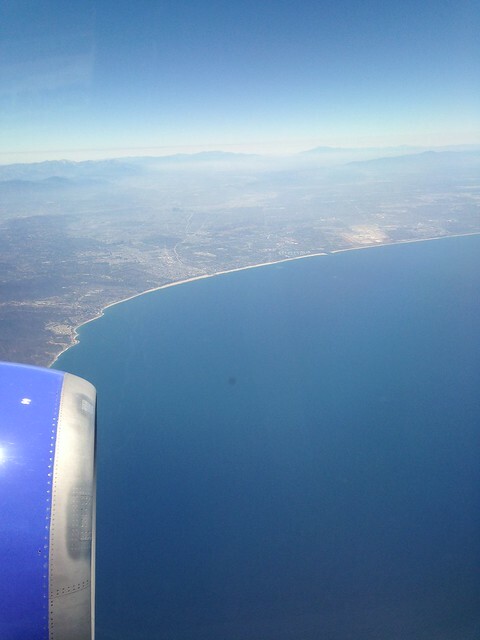 California coast line is so beautiful. Disneyland here we come! 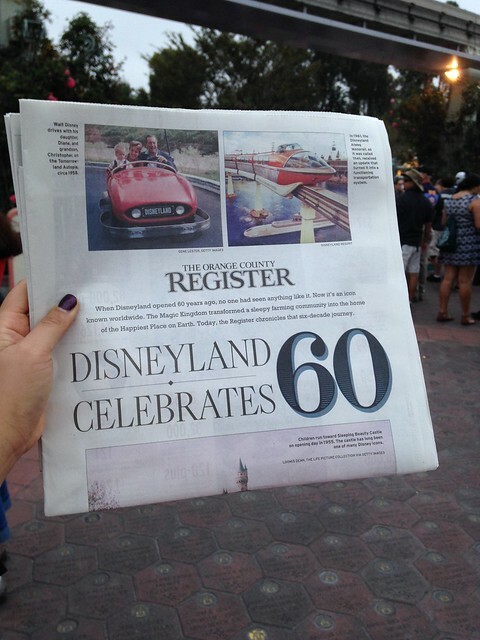 On the actual date of the 60th, every park goer received a copy of newspaper which included an insert copy of the actual paper from 60 years ago. 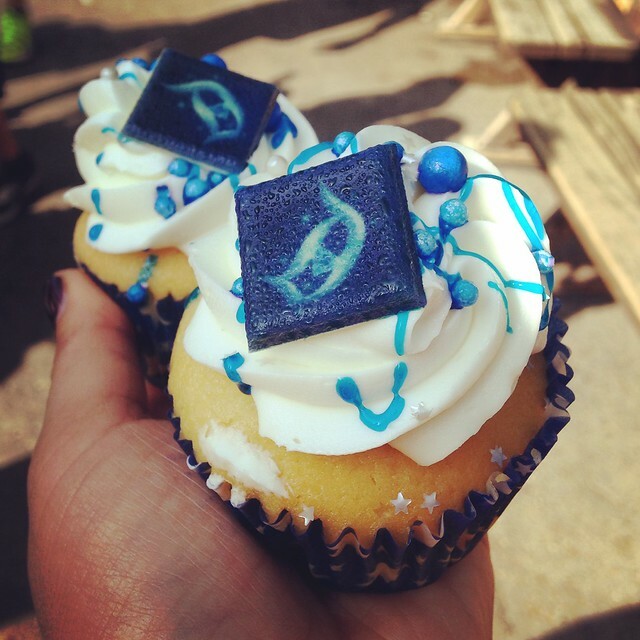 Free cupcakes were given out to all the guests on the day of the 60th anniversary! These were vanilla cupcakes with vanilla frosting. You can purchase a giant and beautifully decorated Diamond Anniversary cupcake (lemon flavored) at the Jolly Holiday Bakery Cafe on Main Street. 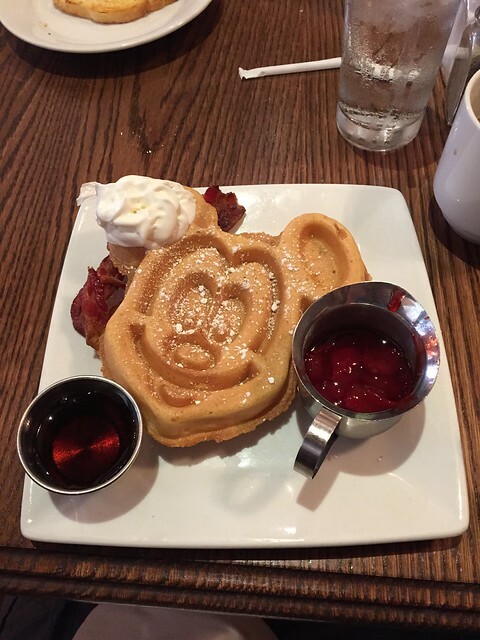 No Disneyland trip is complete without a Mickey Waffle at the Carnation Cafe on Main Street USA. They do take reservations! If the wait at Carnation Cafe is too long, come to River Belle Terrace in Frontierland. 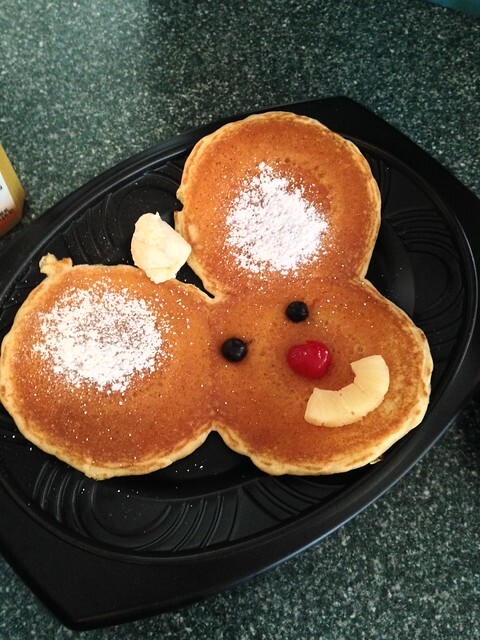 Cafeteria style dining and offers biscuits, crispy potatoes, scrambled eggs, yogurt parfait, and this adorable Mickey pancake. 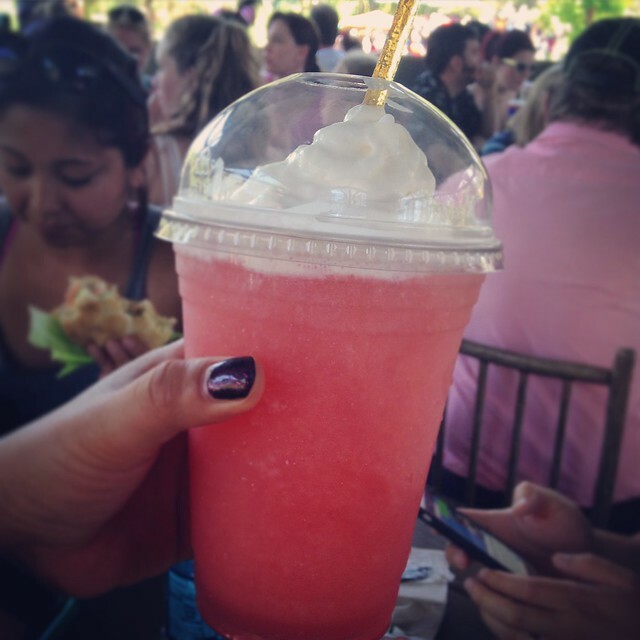 Honey bee frozen lemonade, from the Hungry Bear Restaurant in Critter Country. This was so delicious, especially with the addition of a honey stick. 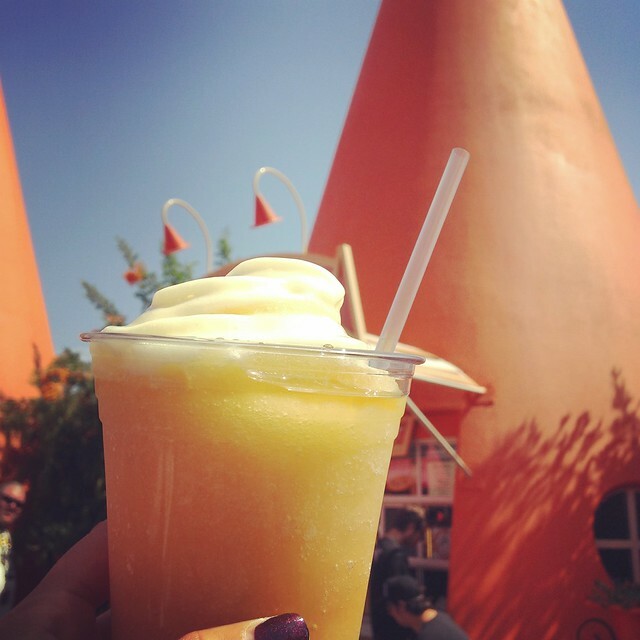 Red’s Apple Freeze from the Cozy Motel (Cone #4) in Radiator Spring (California Adventure). Frozen apple juice slushy mixed with marshmallow syrup and topped with a passion fruit mango foam. This one was on the slightly too sweet scale for me but it was yummy!!! 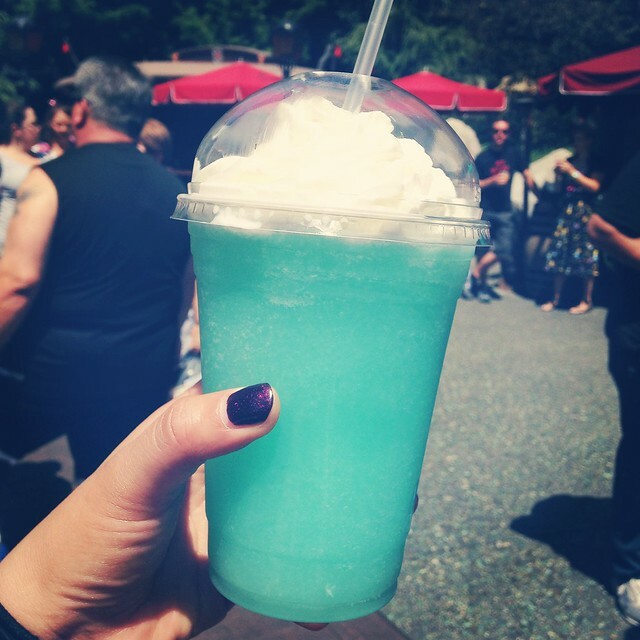 The Blue Monstro Frozen Lemonade from the Village Haus in Fantasyland. This cotton candy frozen lemonade was surprisingly not overly sweet. It didn’t taste like cotton candy though, more of a Calpico/Yakult flavor which I adore! Definitely give this a try! Another way to cool off is with ice cream, of course! Definitely visit Clarabelle’s Hand-Scooped Ice Cream Shop in California Adventure. 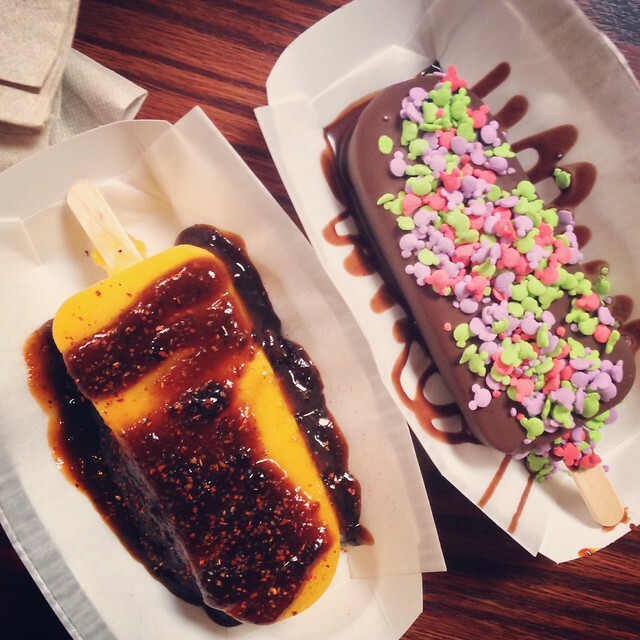 They sell delicious ice cream and over-the-top sundaes, as well as these hand-dipped ice cream bars. They are perfection! The above left is a special off-the-menu item, a fantastic mango bar topped with Chamoy and Tajin. This was a Cinco de Mayo special and available while supplies last. The one on the right was a vanilla bar dipped with dark chocolate and topped with Mickey confetti! 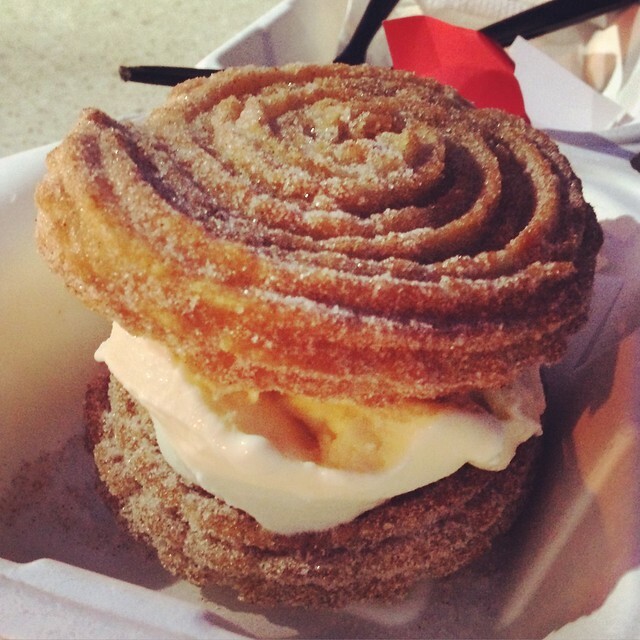 This thing of beauty can be found at the Churro Cart in Downtown Disney. It’s only available in the summer, and very messy to eat but oh-so-good! For lunch, we tried some new favorites and visited our usual spots during our three day visit. 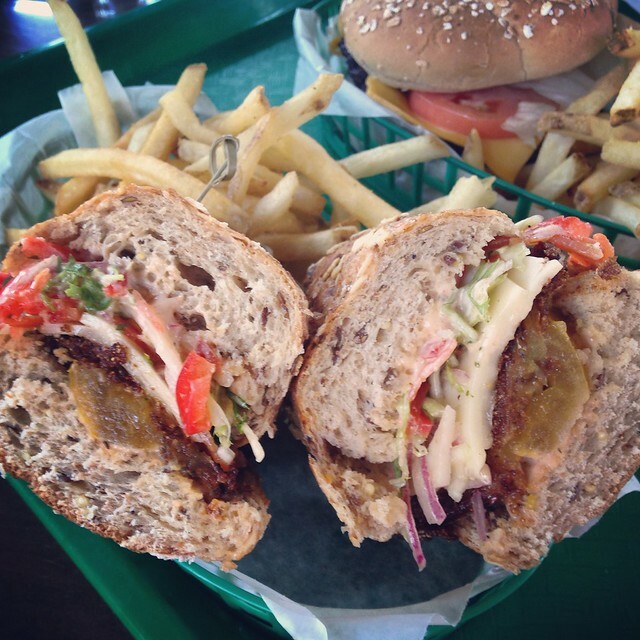 The fried green tomato sandwich at the Hungry Bear Restaurant in Critter Country. This is the perfect sandwich if you want to get away from the usual park fare. The nice jicama slaw complemented nicely with the corn-meal crusted green tomatoes. Loved the pairing with the Havarti cheese and creamy zesty remoulade. Beautifully done, Disneyland! 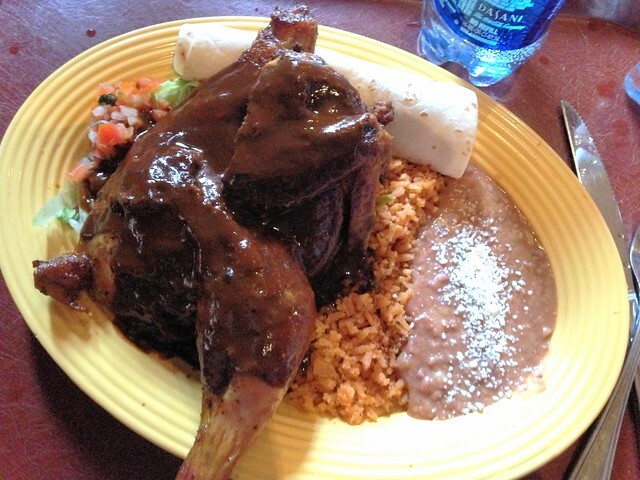 The Chicken Mole from Rancho Del Zocalo. I really wanted mexican food and mole sounded amazing at the moment. I missed the part where it said “1/2 chicken” will be served alongside. There was a lot of chicken on that plate and it was delicious! 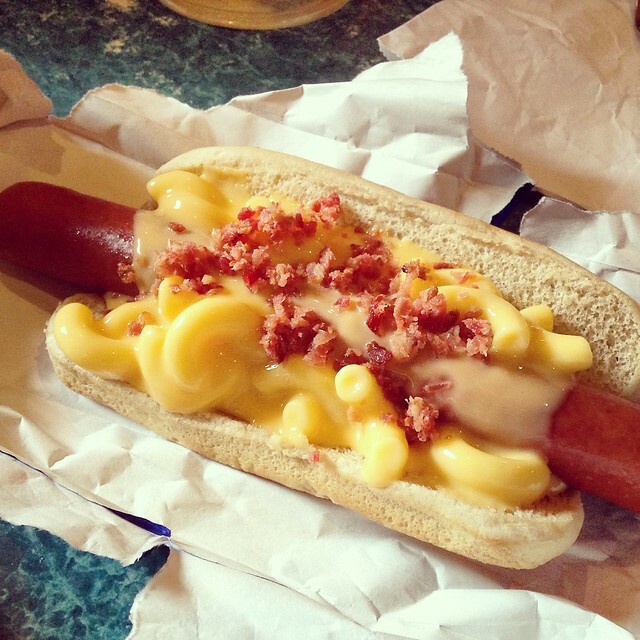 Hot dog and mac ‘n cheese together on a bun? (topped with bacon bits) Insane, maybe! Delicious? DEFINITELY! This can be ordered from the Corner Cafe on Main Street. 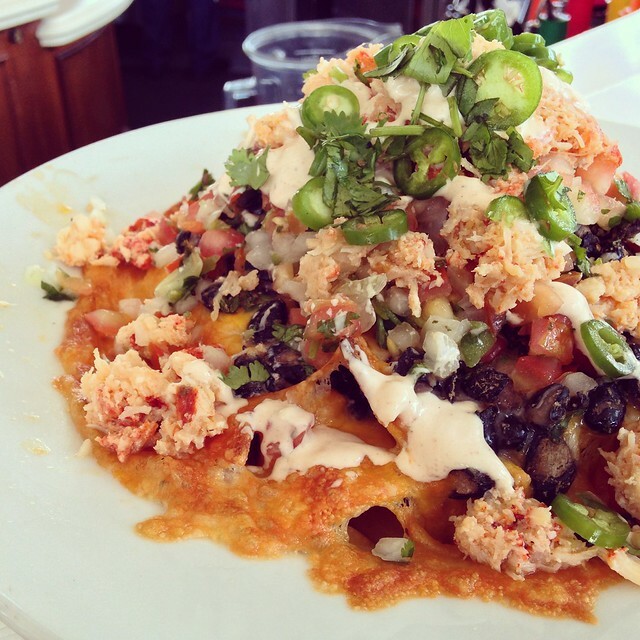 The lobster nacho from the Cove Bar in California Adventure. There’s always a wait, but so worth it. The Cove Bar offers fun cocktails (as well as full bar), and small plates. We love to eat dinner at Cafe Orleans and people watch. The salmon salad here is always perfect. 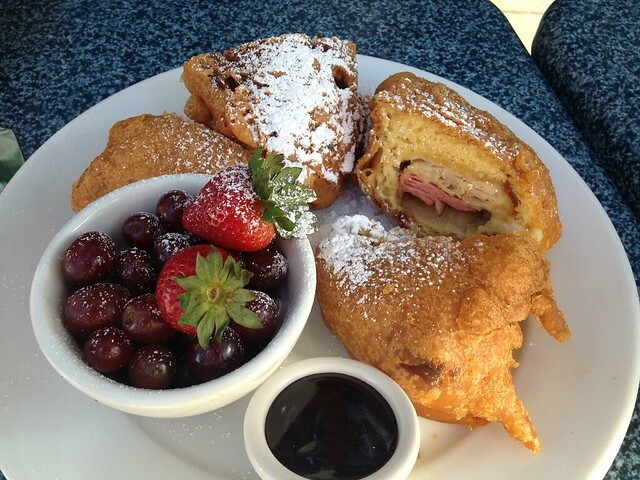 But what’s even more impressive, is this fried monte cristo sandwich. The portion is huge so share this one! 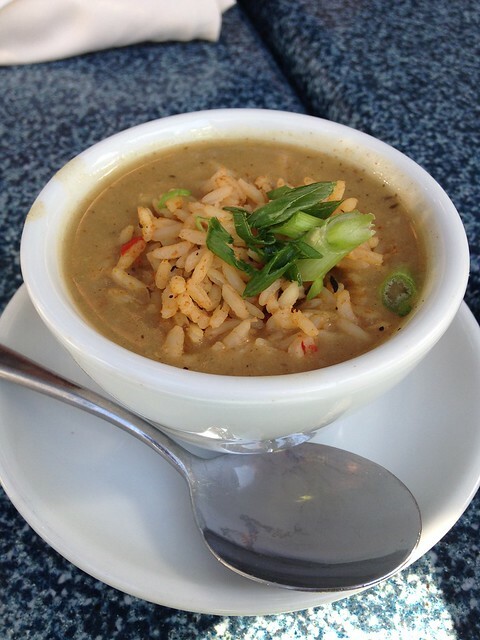 The gumbo with rice at Cafe Orleans is also fantastic. 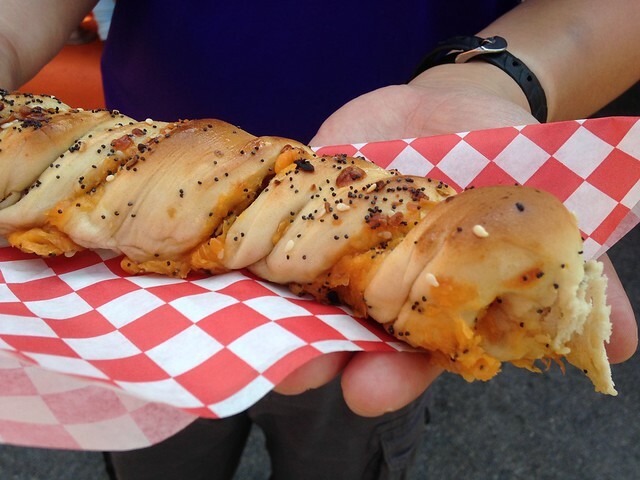 The garlic cheesy bagel twist at the Cozy Cone Motel (Cone #4) in Radiator Springs California Adventure. A little bit greasy but very tasty. Joe and I shared this for breakfast one morning while waiting in line for a ride. There is a stand called Maurice’s Treats (in Fantasyland near the Castle) that sells these yummy twists. 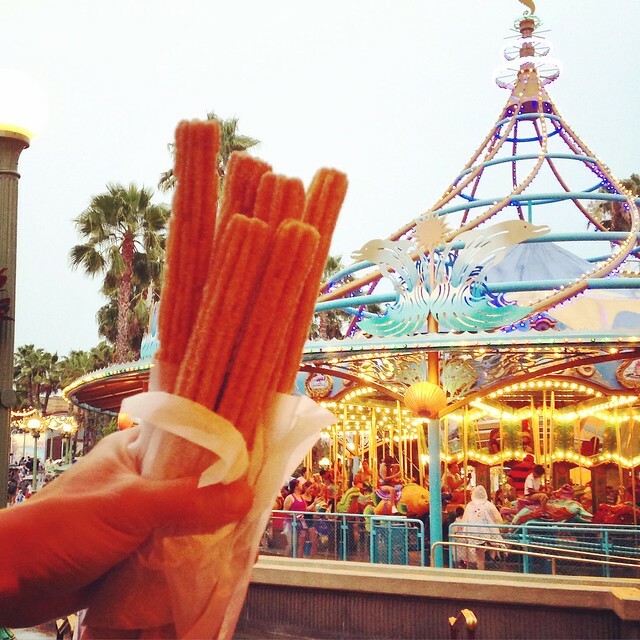 Churros never disappoint! Especially when we were exhausted and soaking wet (yes, it poured!). 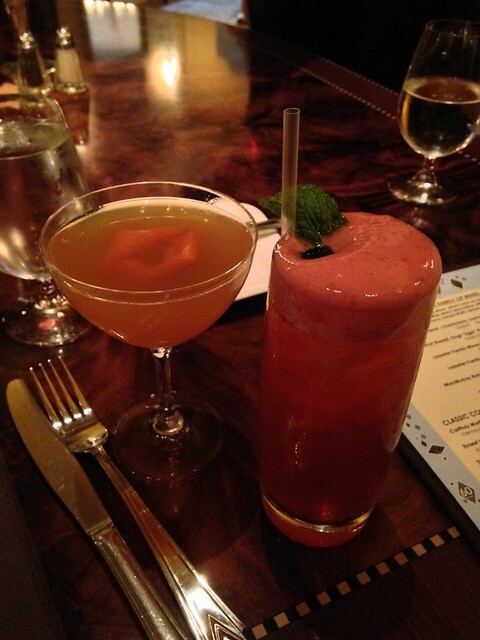 And yes, some delicious cocktails at Carthay Circle! It’s an important part to recharge. 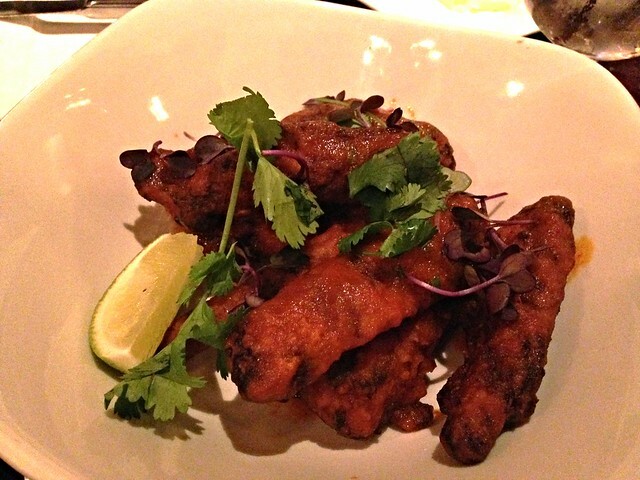 Downtown Disney has some great food too, we like Catal a lot. 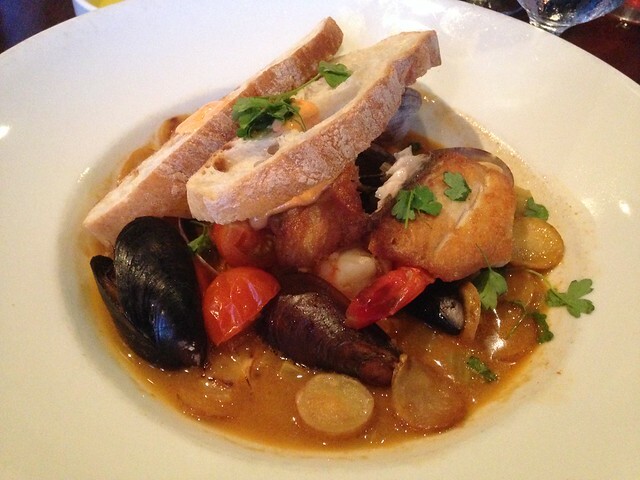 This Catalan seafood stew was perfect! The paellas here are great, too! 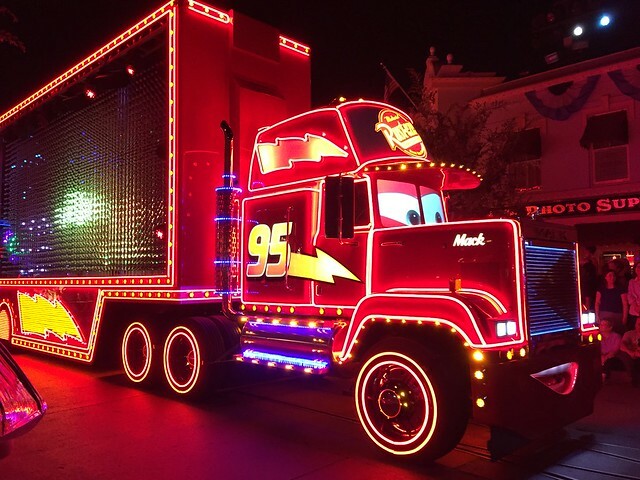 Disneyland’s outdone itself with the Paint The Night parade. 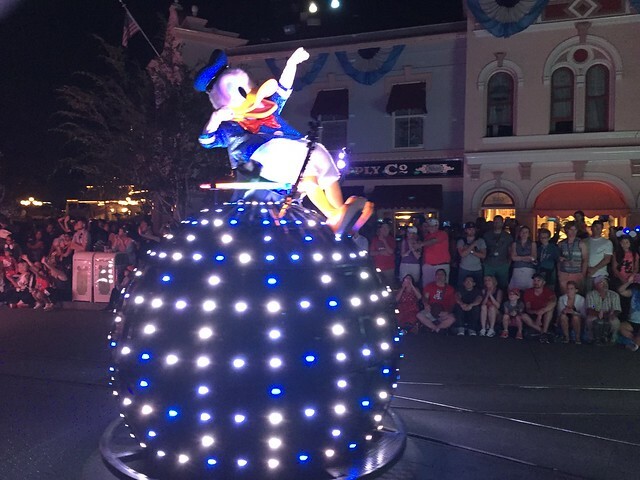 This nighttime spectacular was debuted this year for the Diamond Anniversary. It really was the best parade I’ve ever seen. 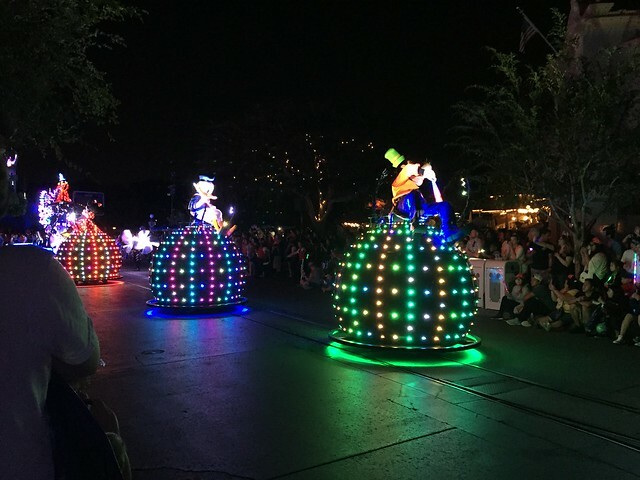 If you go during busy season, be sure to grab a spot on main street at least an hour before the parade. I know it sounds like a long time to wait, but it’s a great opportunity to rest your legs. 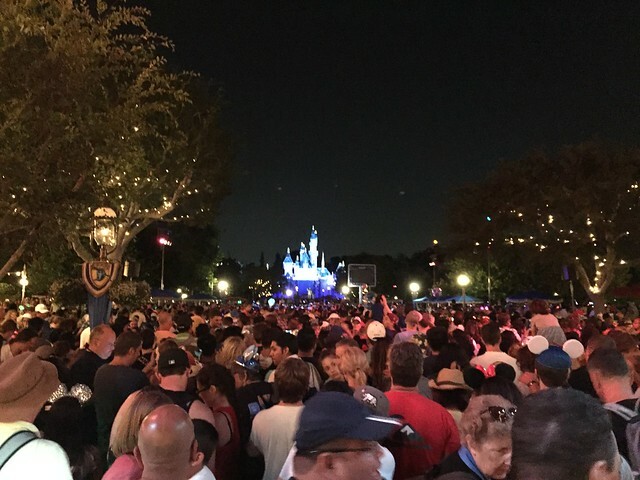 Right after the parade, park goers gathered on Main Street to wait for the firework spectacular. Beautiful show, very well done! The projections and effects were so creative!